Energy efficient lighting is said to be one of the most cost-effective approaches to save energy and reduce C02 emissions. In order to stimulate the application of lighting retrofits of good quality, IEA Task 50, Subtask B “Daylighting and Electric Lighting solutions” has looked into the assessment of existing and new technical retrofit solutions in the field of façade and daylighting technology, electric lighting and lighting controls. The document provides information for those involved in the development of retrofit products or involved in the decision making process of a retrofit project, such as buildings owners, authorities, designers and consultants, as well as the lighting and façade industry. 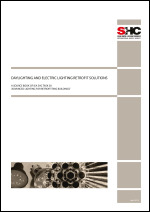 This source book addresses both electric lighting solu¬tions and daylighting solutions, and offers a method to compare these retrofit solutions on a common basis, including a wide range of quality criteria of cost-related and lighting quality aspects. Simple retrofits, such as replacing a lamp or adding interior blinds, are widely accepted, often applied because of their low initial costs or short payback periods. The work presented in this report aims at promoting state-of-the-art and new lighting retrofit approaches that might cost more but offer a further reduction of energy consumption while improving lighting quality to a greater extend. Using 30 quality measures, the Catalogue of Criteria can describe the performance of highly differentiated lighting retrofit solutions, qualitatively and to some degree quantitatively. It allows for comparison of state-of-the-art, new and future retrofit solutions on an equal and holistic basis. This approach promotes lighting retrofits that might cost more but also offer more benefits, which is reflected in the solutions’ quality defined by means of the Catalogue of Criteria. The set of criteria are used as basis for rating the 38 investigated technologies in the source book “Daylighting and electric lighting retrofit solutions”. The Technology Viewer of the Lighting Retrofit Adviser is developed to convey the collected information within IEA Task 50, including approximately 50 different retrofit solutions. This tool within the Lighting Retrofit Advisor offers both a ‘quick glance’ on the retrofits’ performance for easy comparison, as well as detailed information on the selected solutions. When using the Catalogue of Criteria, future retrofit solutions can be compared with the currently available solutions as well.